Trying to figure out how to incorporate “something blue” into your wedding day without opting for the same ol’, humdrum blue garter? Whether navy is part of your wedding theme or you need to choose a blue addition without ruining your color scheme, there are unique ways to stick to this wedding tradition. 1. If you’re the kind of bride who wants bling everywhere you look, why not deck out the bottom of your stilettos, too? 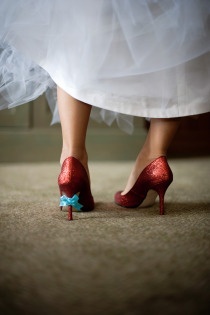 Have your new initials, your wedding date or the words “I Do” spelled out in blue gems on the soles of your bridal shoes. Some brides also like to have their bridal party sign the bottom of their shoes with blue marker. 2. Ask your hair stylist to slide a couple of bobby pins with blue pearls or stones into your ‘do. You’ll be able to pull this off whether you’re wearing your hair up or down. If you don’t want the barrettes to be very noticeable, ask that they be placed toward the nape of your neck instead of near your face. 3. Is blue part of your color scheme? 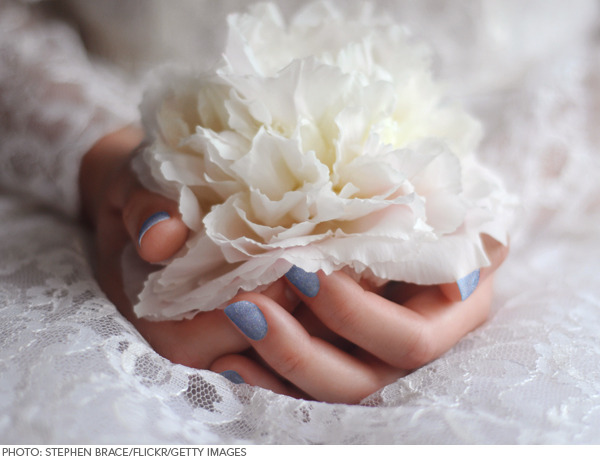 Have your manicurist give you light blue nails or a French manicure with blue tips. If all-over blue is too much to handle, ask her to just deck out one nail in the color and keep the rest neutral. You can also have a tiny blue stone glued to one nail. 4. Blue shoes are undoubtedly adorable, but if you want your feet to stick with traditional white, have just your soles dressed in blue. Think of Louboutin heels with red soles, but in a cobalt or sky blue shade instead. 5. Ask a crafty friend to adhere a small blue, satin bow to the back of your shoes, either at the very top, near your ankle, or on the actual heel. 6. Create an exotic bouquet with flowers in different shades of blue or just include a couple Bluestar flowers for a lighter touch. Alternatively, you can have the bouquet wrapped with a blue embroidered handkerchief or tied with an indigo ribbon. 8. Blue eyeshadow doesn’t have to conjure up images of bad makeup circa the 1970s. Ask your makeup artist to create a modern look with subtle hints of cyan or powder blue. 9. Have your wedding date stitched into your dress’ hem in blue thread. Or, have a blue, heart-shaped patched stitched into your dress somewhere, either exposed or hidden. You can take the patch from a shirt or tie of your husband-to-be! 10. You may not carry it around with you all day, but your “something blue” can be a bridal umbrella or parasol that you pose with for photos. 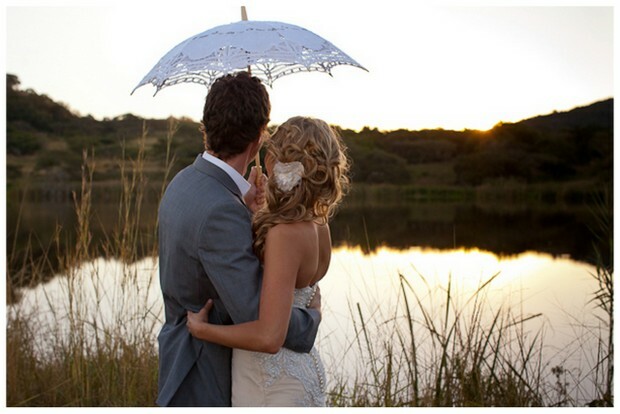 If you’re having an outdoor wedding, it may become a practical prop to protect you from rain or shine, too.